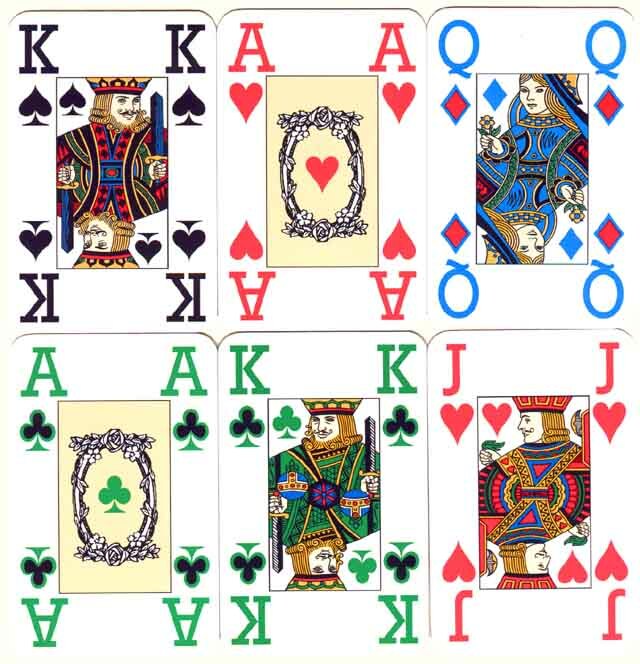 Above: Six of John Newman's Colour cards for playing Bridge. In this new edition, colour borders have been added to the Diamond and Club suit signs to achieve greater clarity. The four Aces are decorated. The cards were designed by Anthony Gray and were printed by Richard Edward Ltd, London. An innovative feature is the use of a different colour for each suit, as opposed to the traditional red and black. John Newman's Colour Suited playing cards were developed for playing Bridge. The colour coding enables the player more easily to sort his hand and follow suit since in addition the indexes are much larger than normal. This means that the cards are also particularly well suited to the needs of the visually impaired, and for children or beginners. Other features are: both male and female double headed jokers (as far as we know for the first time) based on well known Aubrey Beardsley images - see below - and ornamented aces. The new colour cards have been used to publicise a simplified form of Bridge for children known as Mini-Bridge. "New easy-to-read four-colour playing cards are very popular" - David Bird, Bridge Columnist, Mail on Sunday. "The Bridge success story of 1995 has to be colour suited playing cards launched earlier this year by John Newman." - Bridge Christmas 95. "A step forward." - BBC Radio 4 In Touch. 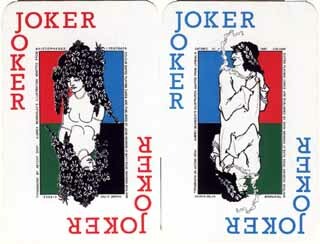 Above: the jokers are adaptations of designs by Aubrey Beardsley, Lysistrata from Aristophanes and Satires from Juvenal's "Satire VI".